Event offers an important night of art, storytelling, and conversation about the connection between arts and our veterans for community and local/state leaders. Local artist, Trish Brownlee, is serving as Artist-in-Residence at Cape Fear Botanical Garden during select dates from July 25 – August 9, 2016 with an exhibit on August 18, 2016. Local Artist, Trish Brownlee, is launching a veteran & community art project “Breaking Rag” and hosting free public workshops in making handmade paper from military uniforms in Fayetteville (March 12th) and Southern Pines (March 19th). 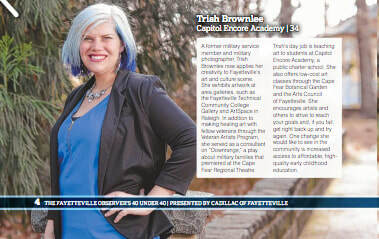 Local Artist, Trish Brownlee, to launch a veteran & community art project in Fayetteville/Moore County & exhibit artwork with Cape Fear Regional Theater in March.